Google will acquire Docverse, a service that lets users collaborate around Microsoft Office documents, we wrote last December. Today that deal has closed and will be announced by the companies. They are not disclosing the acquisition price, but our source last year said it would be in the $25 million range. 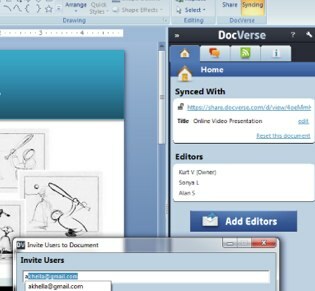 Docverse lets users collaborate directly on Microsoft Office documents. The company was founded by Microsoft veterans Shan Sinha and Alex DeNeui. Shia drove product strategy for SharePoint and SQL Server, $1.6B and $3.0B products, respectiveley. DeNui ran Microsoft SQL Server’s web strategy. With DocVerse Google will have a direct software connection to Microsoft Office, allowing users to collaborate real time on documents. Microsoft is also moving in this direction with Office 10. In effect, Microsoft is countering Google Docs with the new Office. And Google is countering that move with the acquisition of DocVerse. For more on this fight, see Imitation Isn’t Always Flattery: Microsoft Previews Google Apps Killer To Beta Testers. Docverse raised just $1.3 million, in 2008, from Baseline Ventures, Harrison Metal Capital and Naval Ravikant. Update: Google blog post here.